Below you’ll find a few ways that surveys are used. Surveys are core to WikiMapping. Survey functionality is evolving faster than any other, largely because of advocacy organizations and water quality researchers. As soon as we created the ability to let people comment on a map, planners wanted more. Surveys have evolved into a powerful tool with customization of their own. You can create a survey with one or many questions and attach the survey to a point, line, or welcome message. People can comment on survey results imported by someone. If someone ranks a road poorly, someone else can agree or add additional comments. There are many options. A survey can send emails to multiple stakeholders based on survey responses. For example, there’s a problem that a public works department needs to know about, WikiMapping can send the location specific notification when the form is filled out. If there’s a pollution issue, a survey can send a video report of the problem to government officials. You can put a movie or photos into a survey for people to comment on. A survey can create a form letter for advocates to customize and send to a stakeholder. A survey can compute, and we are adding graduated symbology to support researchers. 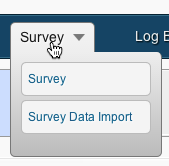 A survey can be editable if you’d like, and you can control who can edit it.